FOR HONOUR AND DIGNITY AGAINST COWARDICE AND DISHONOUR! In New York, the Security Council of the UN voted in favour of using force against the pro-Gaddafi troops, paving the way for air strikes in Libya. The resolution adopted by the Council authorized "all necessary measures" to protect civilians and enforce a cease-fire in the Libyan army. IT’S WAR and the return to neo-colonial gunboats policy of the nineteenth century! The text was adopted by 10 votes on the 15-member Security Council. China and Russia abstained. As India, Brazil and Germany. Cowardice prevailed against the will of War of American-Zionist imperialism and its NATO servants. Before them, Gaddafi had believed in peaceful coexistence with the West. That is today’s the answer of the American West. Total shame, hopeless and without appeal to South Africa and the ANC, which precisely owe widely their victory over the racist system of apartheid, with its Western allies and Israel, thanks to the help of Gaddafi’s Jamahiriya to Nelson Mandela’s ANC. This Mandela who saw in Gaddafi "one of the greatest revolutionary legends of the twentieth century "! In this miserable cohort of traitors, cowards and sold, Sarkozy’s regime is a particularly vile. Sarkozy’s France and neocons with a French passport claimed to play a role, it has simply become prostitutes of its American masters. that of Petain and Kollabos against that of De Gaulle and the Resistance. Ever again the monarchists of 1789-1815, the Versailles or Petainists were the foreign party, relying its oligarchic dominance on foreign armies to crush the French nation. Sarkozy and his embody today this "foreign party”, since 1944 the “American party" that denounced and fought General de Gaulle. The bitter irony of History is that today they are the dross of the Gaullist party – from Sarkozy to Villepin, friends and villains – who brought to power this American Party. After having betrayed the work of de Gaulle. Faced with this obscene and disgusting triumph of dishonour and cowardice, we are with the Great Libyan Jamahiriya, Arab and socialist, one of the last strongholds of Arab and African Revolution, for three decades. In 1986, we had already organized a large demonstration in Brussels against the terrorist bombing of the U.S. and NATO on Libya. We are unconditional friends of Libya, in both good and bad days. At the time of the previous embargo as now that the storm roars again! We fight with and for the Libyan Jamahiriya in the name of our ideas. Because we believe that the "Jamahiryian Socialism" and the "Third Universal Theory" are twin ideologies of our "European Communitarianism." Because the Libyan Direct Democracy is the sister of our European Direct Democracy, and as it is the heir of the First Jacobin Commune of Paris, that of 1792-93 and Robespierre, and the Second Paris Commune of 1871. Because the RCM, the Libyan Revolutionary Committees Movement, is a brother movement, and our long friendship dictates our duty. And we fight with Moammar Gaddafi for the highest values ​​that tends to disappear completely into the sad world Made in Washington: Honour! The Western media are organizing a complete reversal of language such as "Newspeak" of Orwell’s "1984". The Libyan Jamahiryan revolution, with its total Direct Democracy, is also presented falsely as a dictatorship. As German Nazi and Italian Fascist regimes armed in 1936 the Far-right Fascist General Franco – leading a coalition of Fascists, monarchists and religious reactionaries – and organised foreign intervention, TODAY, the USA and NATO do exactly the same. They organise a Coup in Libya and after its failure they install a civil war they intend to support with air strikes. Specifically, in 1936 in Spain, the planes and bombs of the Italian fascist Aviation and the Nazi infamous "Legion Condor" (that of Guernica) were those which supported Franco. Libya is OUR "Spanish War" and this time we will win with the Jamahiriya, the "Republic of the Masses": No Pasaran! 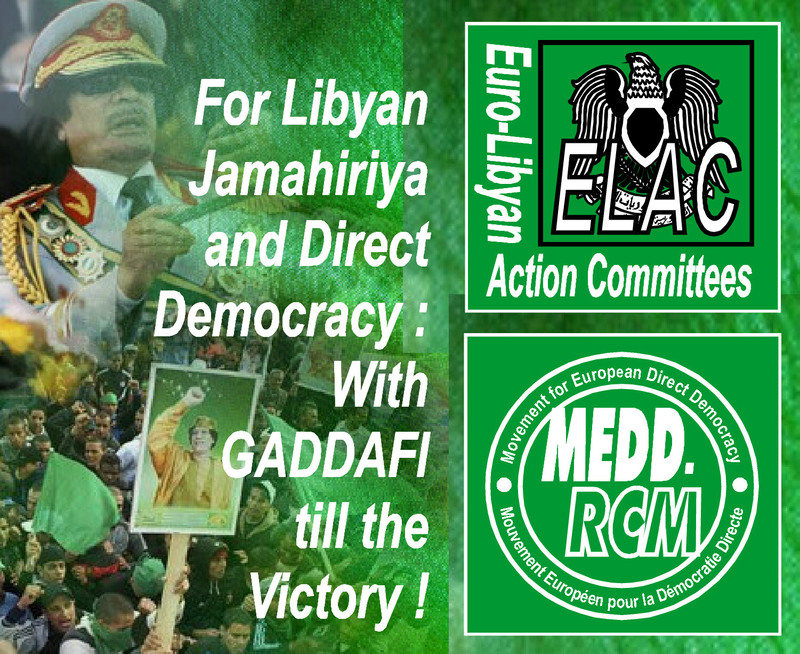 With Moammar Gaddafi, the Jamahiriya- this "republic of the masses" – and the Libyan people to victory!